Watching the World Cup this year reminded me of our last trip to Brasil. We spent six weeks visiting three of the premiere natural ecosystems in South America; the Pantanal, the Amazon, and Mata Atlântica or Atlantic Rainforest. There’s only about 7% of the Mata Atlântica left, mainly in the state of Rio de Janeiro. Living in this unique forest are Golden Lion Tamarins (GLT), one of the most endangered and beautiful monkeys in the world. It is estimated that less than 1,600 are left in the wild. We spent two days watching these active little tamarins in the Poço das Antas Biological Reserve northeast of Rio de Janeiro. The groups we photographed are part of a research project, being conducted by the Golden Lion Tamarin Association (Associação Mico‐Leão‐Dourado). The GLTs in the research area are captured about twice a year, get a physical, and then get marked with a safe black dye so they can be identified by family group. We were at the border between 2 different “tribes” of GLTs and they would chase each other across the path dividing their territories. 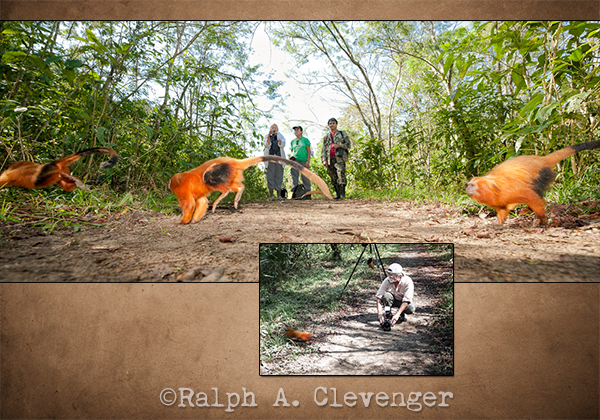 This is a “composite” of 3 images, each having a different Tamarin running across the path in front of my camera. They were so fast I had to use a flash to freeze their motion. 14mm, ISO 400, f/6.3, 1/250sec.